This Anderson Dolly (Commercial Model) will put wheels on your vending machines in 30 seconds! It features 5 inch thermoplastic casters, rated at 1300 pounds. 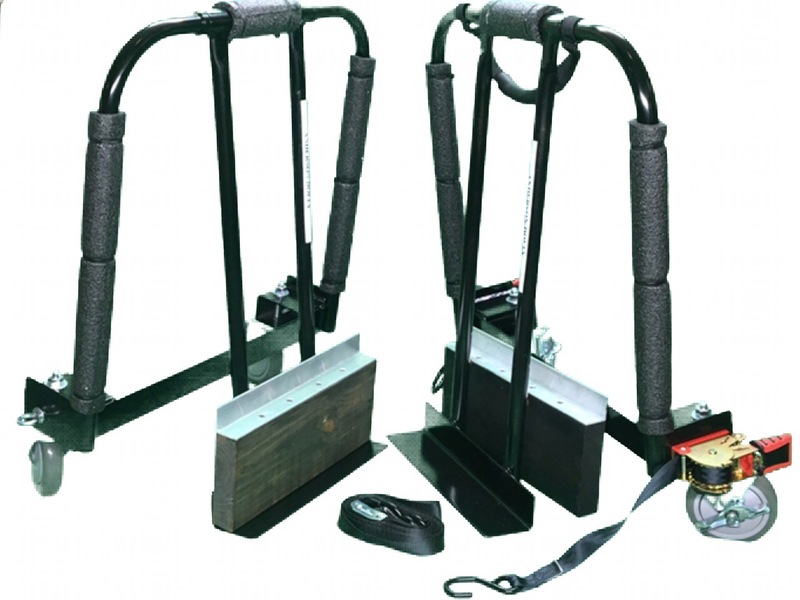 The heavy duty frames are made of high strength roll cage steel and has a LIFETIME WARRANTY. The lift function is 1.5 inches, enough to clear most thresholds. The larger casters allow your load to roll over cracks and bumps easily. Our dolly (set of 2) comes with spacers for moving snack, food, and coffee machines with standard 6 inch legs. This system is the fastest, easiest way to move vendors. If you don't need the spacers click on the All Purpose Dolly for the best price. Can be upgrade to 1600 pounds with the 5X2 inch super duty wheels. Foam included. For loads longer than 6 feet request 2 extra ratchets instead of spacers. Email supervendor1@gmail.com for shipping quote to Canada and for quantity discounts. AS SEEN AT NAMA 2014! Usually ships same day (order before 3 p.m. EST). Thanks Tom, My guys won"t move anything unless they are using y our dollies. Shame on you, you've spoiled my guys. Seriously, we love your product. Thanks. How do I leave a review. I bought the dolly to move my 1185lb safe and it worked even better than I thought. its great to buy a prduct that exceeds your expectations periodically.